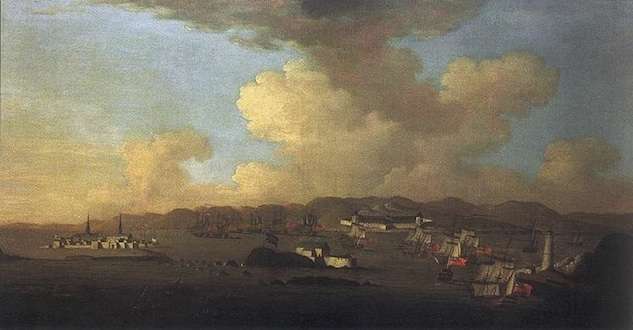 On June 28, 1745, the French military's Fortress at Louisbourg fell to an audacious volunteer army of New England fishermen, farmers and tradesmen. The expedition was New England’s greatest military victory until the American Revolution. News of the French surrender was joyously celebrated throughout the 13 colonies and Great Britain. It was the outbreak of King George’s War in 1744 in North America gave New England colonists just the excuse they needed to organize an expedition to capture the French stronghold on Cape Breton Island. New Englanders were deeply suspicious of the Fortress at Louisbourg because French ships threatened their fishing fleet off the Grand Banks of Newfoundland. Those suspicions had been fueled by years of fighting the French and Indians in such conflicts as Father Rale’s War. Many New Englanders also held a deep prejudice against Catholics. Their fears over French intentions were realized in 1744 when a French fleet burned down a small British fort near Canso, a fishing port used by New England fisherman. The French took prisoners in the Canso raid and brought them to the Fortress at Louisbourg. Some of the prisoners took careful note of the design and fortifications of the fort. They brought that information back to Boston when they were paroled. Morale at the fort was low, and the soldiers mutinied in December 1744. Word of the unrest also reached Boston. Province of Massachusetts Bay Gov. William Shirley took action. He persuaded the General Court to narrowly approve a military expedition to attack the fortress. Gov. Benning Wentworth of New Hampshire went along with the plan. The two governors solicited help from the other colonies, and won promises of 500 troops from Connecticut, a ship from Rhode Island, 10 cannons from New York and money from Pennsylvania and New Jersey. The combined forces were under the command of William Pepperrell of Kittery in what is now Maine. The expedition began to leave Boston in March 1745 with 4,200 soldiers and sailors. They were joined at Canso by a British Royal Navy fleet led by Commodore Peter Warren. Joseph Emerson, Jr., was a naval chaplain for the expedition aboard the frigate Molineux. He was often seasick during the early going. “We live a rolling tumbling life,” he wrote in his diary. The New England colonial forces landed on May 11 and advanced toward the fortress without much opposition from the French and their Indian allies. The French soldiers were outnumbered, poorly trained and poorly provisioned. Their commander wouldn’t let them out of the fortress. For 47 days, the New Englanders and the Royal Navy bombarded the Fortress at Louisbourg. Finally, on June 28, the French surrendered. The celebrations soon began throughout the colonies. I went to the Island Battery where are 30 ambizeers (embrasures) & almost as strong as nature & art can make it. It received great damage from the bums (bombs) & shot from the faction battery at the light house. I went on shore every day this week & viewed as much as I could, by the best account we can get we killed during the siege near 400 men, & multitudes of women & children died throe' the inconvenience of their lodging being obliged to lie underground. The French say God almighty fought for us. The fortress would become a bargaining chip in the peace negotiations between the French and the British. The British returned the fortress to the French over the fierce objections of the colonists. Fortress Louisbourg today is a National Historic Site of Canada. Did the attackers know that women and children were in the fort and were at great risk of being killed or injured? Have re enacted that battle on the New England side.